Agriculture is big business in Brazil. The country is currently the largest global exporter of beef products, the second largest exporter of soybeans, and the fourth largest exporter of cotton and pork. Brazil’s agribusiness boom over the last 15 years is the direct result of huge increases in efficiency—over that time period cropland expanded by 30 percent, while productivity doubled. Increased efficiency in the agricultural sector is the key to keeping deforestation at bay and to tackling the largest source of greenhouse gas emissions in Agriculture: methane from the cattle industry. Increased productivity, however, comes with its own environmental risks and, while the strategy is both politically and economically viable, the resulting methane reductions may not be enough. 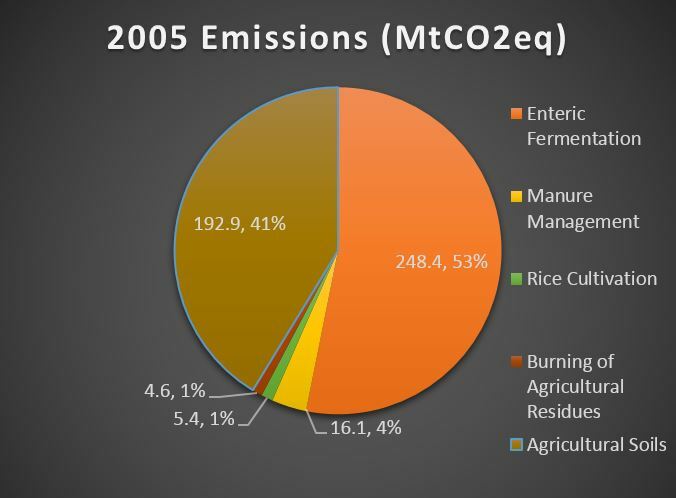 The major sub-sectors contributing to greenhouse gas emissions within agriculture are enteric fermentation from meat–primarily cattle–production (248.4 MtCO2e) and soil exposure (192.9MtCO2e). Mitigation strategies for soil management include conservation farming techniques such as promotion of no-till agriculture, crop rotation, and restoration of degraded pasture-lands. Lowering emissions from enteric fermentation, however, is a little more challenging. Most of the mitigation efforts in this space work to increase the efficiency of methane mitigation—that is, lowering methane emissions per kg of beef. Methods include selectively breeding cattle to reach slaughter age sooner (shorter lifetimes equal less methane) and changing feed to pack on the pounds to achieve the same goal. Other feed switching projects attempt to inhibit methane production directly through limiting reactants or changing the type of fermentation; these, however, are expensive and run a risk of decreasing production rates (weight gain in cattle). As a result, the primary governmental program addressing emissions from the agricultural sector in Brazil does not target methane from cattle. The ABC program targets a number of practices that could lower agricultural emissions, including methane emissions from swine, however it conspicuously ignores methane emissions from cattle. In part, this is because cattle manure management is logistically much more difficult to manage—cattle manure is usually disposed of in pasture, while hog manure is concentrated in open anaerobic lagoons. Of the activities included under the ABC program, integrated crop-livestock-forest management addresses methane emissions, in theory, through the claim that such land management acts as a carbon sink, potentially canceling out some of the methane emissions from cattle; however, the plan does not directly address enteric fermentation through funding of feed switching or promoting certain breeds. Many of the economically viable strategies to lower methane emissions fly in the face of conventional notions of sustainability. Feed switching often includes additives like ionophores (commonly Rumensin®) and other chemical compounds that damage methanogenic microbes in ruminant stomachs during the ‘finishing’ phase of cattle production (think feedlot). Rumensin lowers methane emissions but is frowned upon by the sustainability community, primarily due to concerns of the chemical’s use increasing antibiotic resistance. Additionally, high starch diets (corn) change the type of fermentation occurring in bovine stomachs, resulting in lower methane emissions. Such diets also increase the efficiency of weight-gain, resulting in shorter lifespans. According to a study from the University of Washington, corn-fed cows emit up to two thirds less methane than grass-fed bovine. The study accounts for the carbon footprint of grain-based feed, and concludes that conventional systems require 24.8% of the water, 55.3% of the land and 71.4% of the fossil fuel energy required to produce a given amount of beef compared to grass-fed systems. 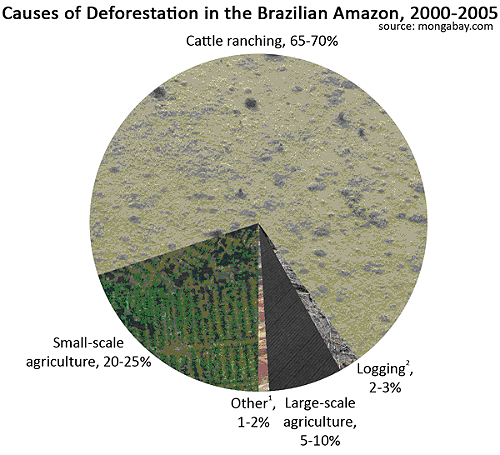 Concentrated beef production is particularly desirable to Brazilian meat producers because of the highly visible debate over the relationship between beef production, land-use, and deforestation of the Amazon. Resulting more from concern over bad land-use-related PR than concerns over methane, agribusiness in Brazil has invested heavily in increased efficiency. 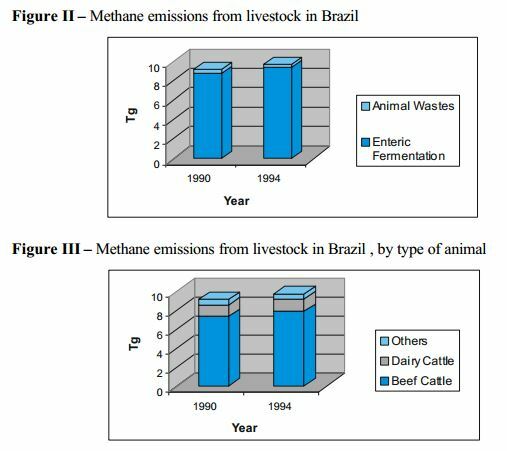 Methane emissions per unit of produce (kg beef) in Brazil have decreased by an average of 1.82 percent per year over the last 20 years; however, beef production has increased at such a rate that over-all methane emissions are increasing by 2.12 percent per year. Despite high investments in increased efficiency, the majority of beef production in Brazil remains grass-fed. As a result, there is large potential for methane reductions through further industrialization of the cattle industry; however, with higher industrialization comes increased environmental risk, especially in terms of water resource contamination through effluent run-off. This, combined with the fact that current levels of increased efficiency have not reduced overall methane emissions, makes absolute methane reductions from in the cattle industry unlikely in the long-run. Methane resulting from cattle production in Brazil is the largest source of greenhouse gases in the agricultural sector. Mitigation strategies involving increased efficiency are economically viable, and, as Brazilian agribusiness controls a particularly powerful lobby, the measures are politically viable. However, mitigation through this avenue comes with significant environmental risk, as well as moral questions. Additionally, increased efficiency combined with market forces will likely result in higher levels of production, and continued increases in absolute methane emissions. The only way to truly lower methane emissions from cattle production without contributing to other environmental issues is to decrease demand—an idealistic strategy with significant cultural and economic barriers.